Our story continues here. If you need to read part 1, here it is. I have him in my sights, and say so – “Aha! I’ve got you in my sights now!” – and turn ever so slightly to reach for the bucket. In a flash he’s gone, scrambled into the jungly understory behind the cottage. Tricky toad. Meanwhile I post about the toad situation on Facebook. Though my fear is quite real, I’m aiming to present a more playful persona online––how I think it’s kind of funny, this weird introduction to life in Florida: poisonous toads and the acceptable means to destroy them. I admit that paralysis and freezing sounds like a slow torturous death to me (imagine how it sounds to a tropical toad! ), but broadcast that I remain faithful in science and intent upon the plan. Friends and family aren’t so sure. They chime in on my post with such helpful comments as: Why not just catch and release him down the street, or Have mercy, he only has one life to live, or Do you even know it’s really dangerous? Days pass with no toad sightings. I begin to wonder if the toad is psychic, sensing his days are numbered. And perhaps he has, in a display of higher consciousness – an awareness of cause and effect, and an understanding of how his self-determined actions might influence future outcomes – voluntarily removed himself from the property. I ponder these things as we stretch into Week Three. While Pepper, the more skittish of our two cats, is still in one of two modes, either curled beneath our king-sized bed or crammed behind the washing machine in the laundry room, Pickle, our little adventurer, is craving the outdoors badly. She sits patiently by the hurricane doors, staring through the tempered glass, her body upright but motionless like a little Buddha, seemingly contemplating the enlightened moment I’ll let go of my fears and allow her her freedom again. Both cats had roamed freely in Oakland, and in six years we’d had just one minor scare with Pickle. Well of course it seems minor now, but at the time – with her missing for three days, and me having wallpapered the neighborhood and neighboring neighborhoods with flyers on every telephone pole, walking blocks morning and night with an open can of tuna, calling, “Pickle! Pickle!” – I was sure she was dead. I threw myself across our bed and laid there weeping. I imagined a hawk swooping down to sink its razor claws into her thin hide, carting her off to pluck out her eyes and pick the flesh from her bones. I pictured a rabid dog hunting her down, crushing her tiny neck with its powerful jaws. I saw her starving to death, alone and terrified, trapped in some neighbor’s garage. In the end, it was that last scenario that came closest. Ever the explorer, she’d wandered into the basement of the quirky woman with the cockatoo across the street. Thankfully the woman saw one of my flyers, checked her basement, saw Pickle’s eyes shining in the dark, and called me. I remind myself of that time, my intense fear, and how unhelpful it was. How they say most of the things we worry about never come to pass anyway. So despite my lack of toad-disposal success, I acquiesce, opening the back door a few inches, feeling the rush of air-conditioned air escape along with her. She slithers into the heat, sniffs left, then right, then slinks over to the jacuzzi and wraps her slender body against its shady side. We do this day after day, and once she grows tired of the jacuzzi wall, she finds a new shady spot. Spreads herself flat against the concrete slab beneath the gazebo just to the left of the pool. We are taking baby steps together, this little cat and I. So I allow her these excursions for only brief periods of time, and only when I too am outside and can keep my eyes on her. In Week Four, everything changes. Pepper, no longer content to hide beneath it, develops a new routine of burrowing into our unmade bed and curling tight beneath the covers, where she remains until darkness descends. It’s almost as though she can’t stand the sight of Florida. (I don’t blame her, I’m missing Oakland too.) 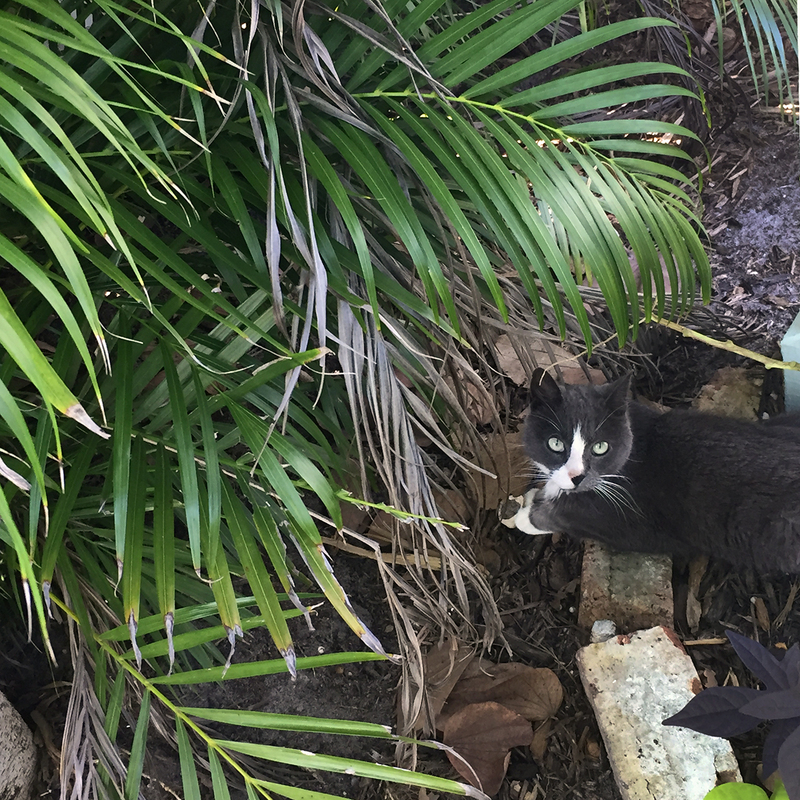 On the other hand, when I let Pickle out mid-morning, instead of going to one of her two regular spots, she darts off towards the back of the property, towards what can only be described as… The Jungle. A pang of fear clenches my gut and I bolt after her. The yard whizzes by, green and menacing, but when I turn the corner of the cottage I nearly skid to a stop, somewhat comforted to find her delicately sniffing about the small brick patio in back. As I watch her, I’m not quite sure how, I’m not sure if something twitches ever so slightly and catches my eye, or if it’s something more akin to a moment of divine intervention where, intuitively, my attention is drawn to a very specific, and perhaps predetermined, point in time and space. Whatever the case, I see the toad! Crouching by the rear corner of the cottage beneath the shady boots of an ancient cabbage palm, I can see only his warty backside and haunches – his nose and face buried under a hood of leaves littering the ground. Perfect, I think. I can see him, but he can’t see me. Pickle is absorbed in her sniffing several feet away, so I make a mad silent dash for the tupperware at the back door (downsized from the bucket after the futility of my earlier attempts), and stealthily return, holding my breath with the hope that the toad will still be there. I’m amazed to find he is. In fact he seems quite dazed, and I wonder if perhaps he is sleeping. I tower over him, trying to catch my breath, inhaling deeply, thinking calming thoughts, intent to not make any sudden moves that might startle him to bolt through the undergrowth where there’d be no chance of capture. I lean closer. Slowly lower the tupperware. Then swiftly slip it on top in one fluid motion. Gotchya! He completely fills the width of the container, which technically isn’t a tupperware but rather a quart-sized cup that my last batch of tortilla soup from Senor Burrito came in. Which is to say, it’s big. And tall. And though he’s pinned side to side – in fact one foot sticks out, his chubby ankle trapped under the edge of the cup, so that I have to jiggle it side to side to get him to pull his foot in – there is still empty height above him inside the container. I think he realizes this just about the same time I do, because this is the moment he jumps. He slams into the top of the cup, where, if not for the weight of my hand pressing down, he would surely have toppled the cup and escaped. He jumps and jumps and jumps. With surprising power. I have to really hold on, pushing down with much of my upper-body strength, and wonder how in the world I am going to transfer him into anything else or move him at all. I clearly haven’t thought this through.